Cañas and from the sponsor Monty, on of the leaders of the biketrials world. The team have seven years of experience and have won no less than 23 individual titles at both national and international levels; Gemma is the current BIU and UCI World Champion. The Abant sisters have their own high quality website on which you can follow their season and their news day by day: Abanttwins.com. 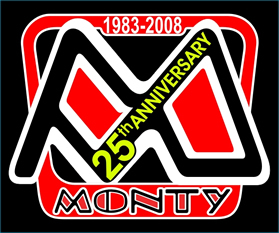 The site also serves as an online shop, which is one of the most important in Spain and is one of the country’s main online Monty dealers. A few days ago they unveiled the first pictures of a garish new bike: the Monty Kamel XXV LIMITED EDITION. This Kamel 25, created to celebrate the 25th anniversary of the brand, is limited to just 250 models and is a special version of the brand’s flagship model the Kamel 221. 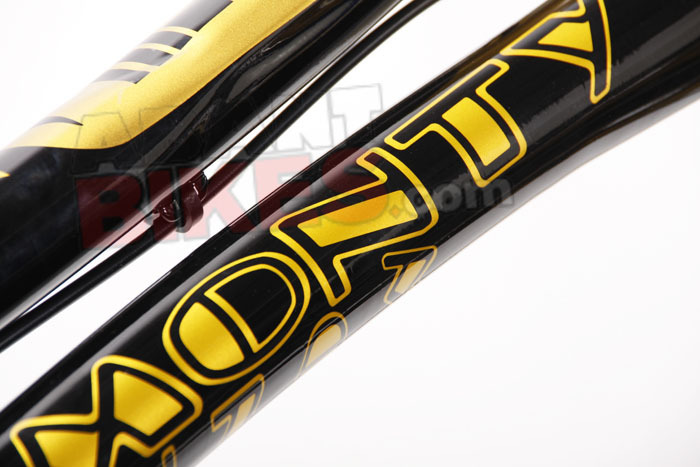 It features a unique and eye-catching black and gold paintjob and each model is numbered. 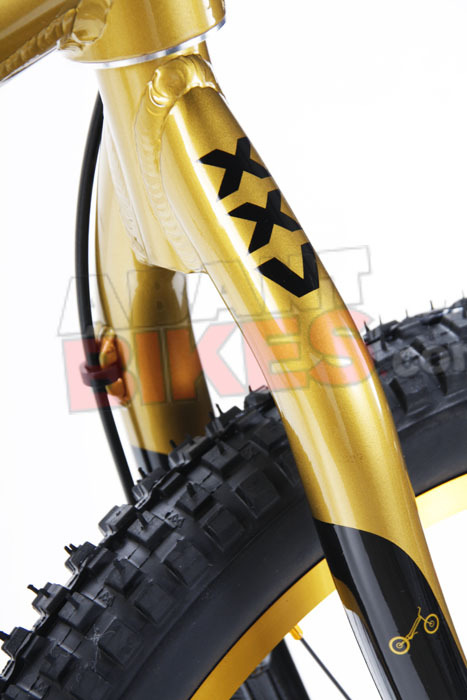 Below are the photos and specifications of the XXV, which keeps the proven geometry of the 221 but is a different bike altogether thanks to several technical changes. 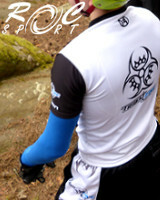 Could this be a preview of the 2010 range? The frame adopts a redesigned headtube, thicker top and down tubes and a reinforced central section (seat tube junction). The fork has been completely redesigned. The first new feature is a thicker, one-piece steerer directly onto which the fork legs are welded. 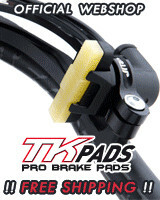 The fork is composed of 100% 7005-T6 Aluminium. The transmission has also been reworked. After several months of testing, Monty presents a new 15-10 gear ratio, which does not change the ratio, which remains at 1:1.5, but allows the bashguard to be made smaller, improving clearance and saving weight. The new freewheel is completely waterproof thanks to the incorporation of two pieves of plastic positioned in the body to prevent dust, water and dirt from getting in. The small ten tooth cog has also be reworked and Monty claim that it is a revolutionary design, with shape and thickness allowing improved traction while pedalling. The hubs have been lightened and redesigned to allow for the small diameter of the fixed cog. The full weight if the new Kamel XXV is published as 8695 grams! La finale 26" de Knokke-Heist a été l’occasion d’un duel sans merci entre Kenny Belaey et Gilles Coustellier, et c’est le premier, le plus régulier, qui s’est imposé à domicile ! Benito Ros s’impose en 20" et renforce son leadership sur la Coupe 2009. La station balnéaire belge de Knokke-Heist accueille ce week-end la quatrième manche de la Coupe du Monde de Vtt & Vélo-trial. Elle se déroulera comme chaque année sur la plage. Présentation par ici ! 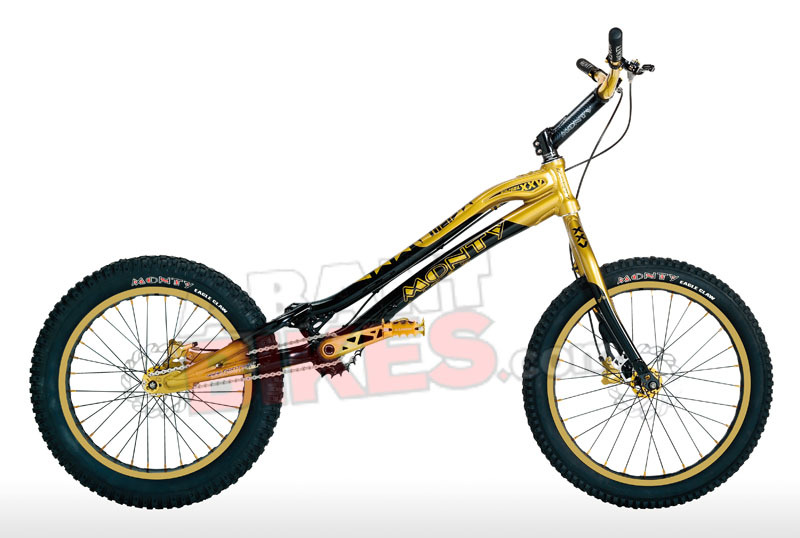 The Abantbikes shop recently unveiled the first photos of the new 20" bike at the top of the Monty range : the Kamel XXV, a new black and gold version of the famous 221 of which only 250 models will be made ! Thibaut Marriaux nous présentait ce week-end à Samoëns les nouveaux TMS Evo 3 avec leur finition définitive. Un Evo 3 qui se déclinera dans une nouvelle version taillée pour le street : l’Evo 3 option 24 ! Voici une retour complet sur la seconde et avant-dernière étape de la Coupe de France, dont la course Elite a été l’une des plus surprenantes de la saison : Gilles Coustellier termine au pied du podium et Vincent Hermance est N°1 ! La seconde manche de la Coupe de France de VTT-Trial 2009 se déroule ce week-end au cœur même du village de Samoëns : ce trial urbain se jouera sur 16 zones artificielles. Présentation complète de cet évènement par ici ! Voici un entretien réalisé hier après-midi avec Gilles Coustellier, dans lequel il revient sur ses derniers exploits (les titres français et européens 2009) et évoque l’objectif le plus important de sa saison : l’or australien ! | An interview with Gilles Coustellier in which he tells us about his latest exploits (his 2009 French and European titles) and his most important goal of the season - gold in Australia ! A collection of photos of the new 20" being developed by Singapore trials company Rockman, currently being testing by young English rider Kieran Whitefield. It is long and high and the name means "sickness" in French ! The Return of Tibo ! A new video of Thibaut Marriaux, the TMS boss, in showman mode on his Combo 24"... It’s good to see that he’s back to full health following his risky brain operation. The 2009 World Championships will take place between the 1st and the 9th of September in Canberra, the Australian capital. Here are the first photos of the sections, which are currently under construction. Spanish rider "Origami" sent us these photos of his Rockman Kortz, which he built up using the lightest selection of parts available, some of them lightened even further ! The result : 7.89kg ! Voici de nouvelles images de Thibaut Marriaux, le boss de TMS, en mode showman sur son Combo 24"... Des images qui nous rassurent sur son état de santé, au lendemain d’une opération chirurgicale risquée au cerveau ! | A new video of Thibaut Marriaux, the TMS boss, in showman mode on his Combo 24"... It’s good to see that he’s back to full health following his risky brain operation. Voici quelques photos d’un nouveau cadre 20" développé par la marque singapourienne Rockman et actuellement testé par le jeune rider anglais Kieran Whitefield, un modèle long et relevé qui a un gros défaut : son nom ! | A collection of photos of the new 20" being developed by Singapore trials company Rockman, currently being testing by young English rider Kieran Whitefield. It is long and high and the name means "sickness" in French ! Here are the French champions for 2009 : Elite - grand master of 26" trials, Gilles Coustellier ; Expert - Marius Merger ; National - Thomas Jury ; R1 - Maxime Muffat Joly and R2 - Jérémy Descloux ! Voici les Champions de France 2009 : en Elite, Gilles Coustellier, le grand patron du vtt-trial mondial, en Expert, Marius Merger, en National, Thomas Jury, en R1, Maxime Muffat Joly & en R2 Jérémy Descloux ! | Here are the French champions for 2009 : Elite - grand master of 26" trials, Gilles Coustellier ; Expert - Marius Merger ; National - Thomas Jury ; R1 - Maxime Muffat Joly and R2 - Jérémy Descloux !